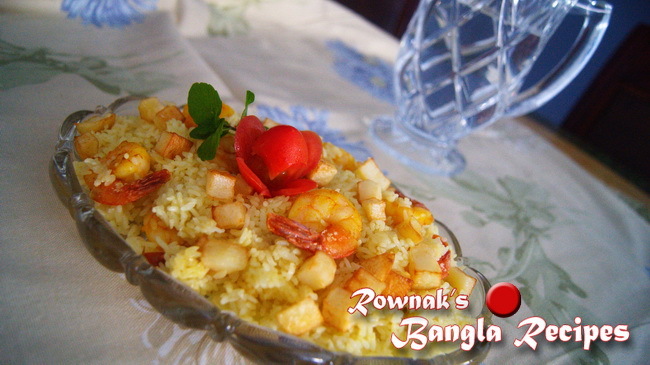 Most of us make prawn curry mixed with rice( chingri curry makha bhat) instead of making Chingri Polau / Prawn Rice. 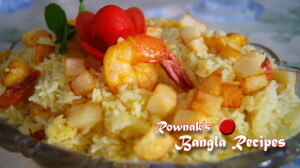 Chingri Polau / Prawn Rice should be unique prawn flavoured rice with minimal spices. Some of us love to peas, potatoes, cauliflower even carrot. Personally I love to use fried crispy diced potatoes. Using potatoes and vegetables is optional or to your taste. I used oil here to keep prawn’s smell intact. 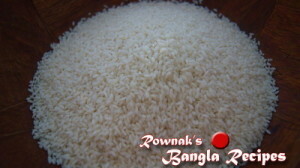 And about rice please please try to use Chinugura or Kalijeera (tradition Bangladeshi polau rice), I bet that you will love taste this rice. Please don’t forget to join my facebook group or like my facebook page to keep in touch with me .Thanks. 1. Wash rice and soak it in water for 20 minutes. Place rice into strainer and keep it aside. 2. Wash the diced potato and pat dry it. Mix baking powder, salt and vinegar to it. 3. Fry the potato in medium heat till it becomes crisp light golden brown. Remove fried potato pieces from oil and keep it aside. 4. 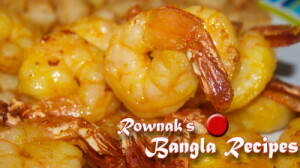 Mix turmeric, ¼ teaspoon salt with prawn and fry it in same oil for 2-3 minutes. Remove fried prawns from oil and keep it aside. 5. In same oil add chopped onion and fry till it becomes transparent. 6. 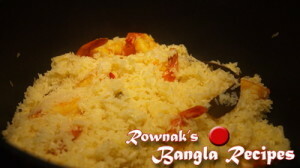 Add rest of spices except green chillies, ½ ts salt and milk and cook it till oil is separated. 7. Add rice and fry it for 2-3 minutes (stir occasionally). 8. Add 3 cups of warm water, green chillies and sugar in it and cook it under closed lid 10 on medium high heat. 9. Add prawn and give a stir. Cook (dum-e) on low heat and 5-6 minutes. 10. 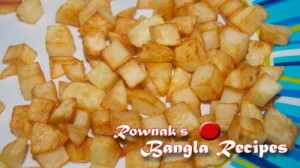 Check salt and add fried potato pieces with poluo. 11. 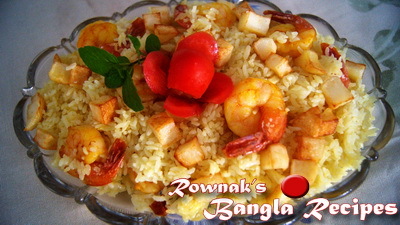 Enjoy Chingri Polau / Prawn Rice. Chingri Polau..must be delicious!I’ll try it Thanks a lot.. Thanks Rawnak for continued sending receipes. I always try to cook as per your instructions. Some time I become success to do but some time I fail to reach on real test. Likewise I tried several time to make Roshogullah and Chomchom as per your instructions but until now unable to make it as I find in the sweet shop. However, my wife is not so interested for any new cook, she cooks only family’s old days cooks but I like to cook always something new, so I always try to do myself any new cooking. My wife is Urdu speaking so her dishes are different then our Bangla foods. Please continue to send me Bangla recipes. Thanks and wish you all the best in your life. yeah please use you local rice then. Thanks for your words and pray for my food journey. Can I serve chicken or any other meet with chingri polau. yeah you actually use Chingri polau as a rice. In that case you can use less prawn. If I am doing it, I will serve chicken fry or few kabab or deep fried food with it. In this its taste will be intact. Thanks. Hi! I am from India, Kolkata. I like your blog very much. Last May I visited Gold Coast. It’s a very beautiful place. Please keep your recepies on. Gold coast is a beautiful city. Thanks for your words. Hi. I love your recipes. I wanna know something. Can u plz tell me how many cups of water I need for one cup of rice? Actually I wanna make akhni. That’s y. If u can Plz reply me ASAP. Thank you so much. for 1 cup rice you need 1 and half water. Thanks.